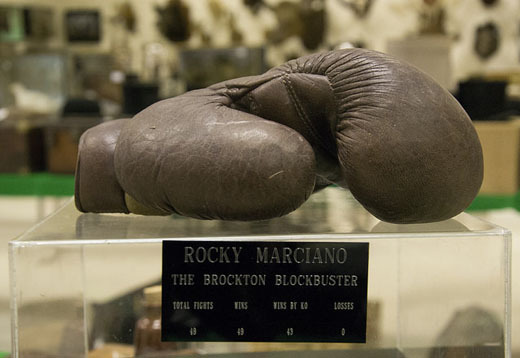 The Slazenger boxing glove in perspex case sold for £580. It had been expected to achieve £100 to £150 when it went under the hammer at the Moore Allen & Innocent Sporting Sale in Cirencester on Friday (February 7). Marciano – inspiration for the Rocky movies – met the Kray twins in 1965 during a trip to London with the Hollywood actor George Raft. The stars were taken to Repton boxing club in the East End by the Krays, and Marciano dispensed advice to the amateur boxers. Marciano fought 49 undefeated bouts from 1950 until his retirement in 1956. Forty three of his wins were knock-outs, and his undefeated run as Heavyweight Champion from 1952 until 1956 is the longest on record. The boxing glove was one of a number of personal items Reggie Kray was allowed to keep in his cell on transfer to the low-security Wayland Prison in Norfolk. It was sold with a prison application form, seeking permission to ‘hand out’ the glove to a friend in 1999, a year before Kray’s death. Despite the interest in this piece of gangland / pugilistic memorabilia, the boxing glove didn’t make the top price of the day, however. That honour was reserved for another gangster favourite – a double-barrelled shotgun. The Wanless Brothers 16 bore shotgun, with side-by-side 27-inch barrels, achieved a winning bid of £1,100, while another shotgun – an AYA Coral over and under 12 bore shotgun with 28-inch barrels – sold for £600, and a Thomas Bland & Sons ‘The Brent’ 12 bore shotgun with 30-inch side-by-side barrels made £500. In the paintings section, a shooting scene – an oil on canvas by William Thomas Such called Shooting Woodcock – achieved £900, while a hunting scene – The Earl of Lonsdale, featuring the aristocrat ‘jumping 33 feet four inches’ at Great Dalby with The Quorn of the Mullagh – sold for £600. In the taxidermy section, a leopard skin rug with mounted head sold for £900 – three times the top end of its £200 to £300 estimate – while a stuffed and mounted fox in naturalistic setting with duck prey, by Hutchings of Aberystwyth, sold for £580. The stuffed and mounted head of a wild boar, meanwhile, made £420. And in the fishing section, an Ari’t Hart salmon/salt water fly fishing reel, with spare spool and clutch mechanism, landed a winning bid of £280, as did a circa 1912 Hardy Perfect four-and-a-half inch salmon fly wheel, and a Hardy CC de France 5ft 5ins split cane trout fly rod. This entry was posted in Antiques, auction, Sport and tagged antique, Antiques, auction, boxing glove, Cirencester, Cotswolds, gangster, Moore Allen & Innocent, Reggie Kray, Rocky Marciano. Bookmark the permalink.